July/August 2018 print issue of Concrete Homes + Low-Rise Construction Magazine. The McDowell residence in Llano County, Texas, really couldn’t look more unlike the stereotypical vision of an ICF home. That’s partly why it was the first place award winner in the unlimited residential category of the 2018 ICF Builder Awards. The home has many arched openings and gables, 70 windows and doors and is finished with natural stone. Of course it helped that owner Pat McDowell was also the general contractor. He had a clear idea of what kind of home he wanted going into the project. 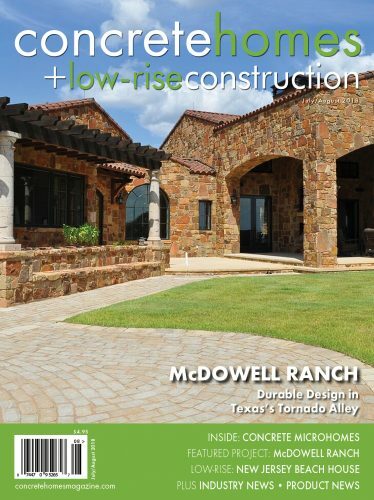 McDowell and his crew used NUDURA ICF for this nearly 6,000-square-feet family home. McDowell’s family has owned ranchland in the Texas Hill County for decades, and they sought a long-term residence on desirable property they intend to keep. “We spent a lot of effort and a lot of money on this house and we plan to keep this land in our family for many generations,” he says. “I didn’t want it to become a maintenance nightmare 100 years from now. If somebody does decide to tear it down in the future they’re going to be using my name in vain!” he says with a laugh. It was a little harder to decide on which brand of ICFs, though, although NUDURA won out partially because the blocks fold flat to make shipping less costly and bulky. McDowell also liked the dovetails that locked the concrete to the form along with the wide variety of form configurations NUDURA has available. Also, McDowell says, the NUDURA support they received from regional sales manager Cameron Ware was incredible. The family’s area of Texas is at the southern end of “tornado alley,” so structural durability was very important to them. They used storm-rated doors and added an above-ground storm shelter. The master bedroom’s closet has no windows in it, so that can be used as a safe room as well. Their previous home, which was built with 2×6-inch dimensional lumber studs, was drafty and allowed outside noises to be heard inside the home. McDowell says this home is tight and quiet. Furthermore, even with 6,000-square-feet of interior space their electricity bill is less than $200. The main house, which has the master bedroom, master bath, study, living room, dining room, working pantry, kitchen, laundry/multipurpose room and two powder rooms, is all on one level. Two separate detached guest houses have bedrooms and bathrooms. The garage is detached with a covered walkway to the home, and over the garage is an apartment with a full kitchen, laundry room, full bathroom and living room. The garage apartment has a patio with a concrete roof and ICF walls under the patio which makes a second storm shelter and storage room. The couple have traveled extensively and will have friends visiting from all over the world. The detached guest rooms allow guests to feel welcome, while also having their own space to retreat to. “We built the three detached quarters because we didn’t want guests to feel like they were imposing,” he says. Designer Joe Volpe has more than 35 years experience designing homes, but he had never designed an ICF home. McDowell says he was quickly on board to use ICFs and it was an easy transition for him to allow for the 17-inch thickness of the exterior walls. The home’s barrel vaults, groin vaults, domes and eyebrow arches add visual interest and are features not often seen with ICF homes. Each room of the home has a different plate height (the measure of the highest and lowest point of the exterior walls). One thing that helped them plan out the home functionally was 3D model which allowed virtual walkthroughs. The McDowells walked through scenarios such as bringing home groceries and walking into the home through the garage. They noticed that stepping up to enter the walkwayand opening two doors with hands full of grocery bags would not work well. They were able to design around those inconveniences by extending the driveway with pavers around the side of the house to provide direct entry to the kitchen and pantry, which has an extra refrigerator and freezer. One thing McDowell learned in the aerospace industry was the importance of having a trusted team. A couple of the contractors he initially worked with were pushing back on working with ICFs simply because they were unfamiliar with them. The interior is finished with travertine tile in the bathroom and kitchens and an engineered wood product with a hardwood veneer for most of the wood floors inside. More than 990 tons of stone provide decorative touches around the interior and exterior. Inside, they finished the interior walls to a level 5 drywall, whereas most Texas homes only have level 3. A level 3 drywall job, McDowell explains, has three coats of mud that is feathered out and sanded to smooth out the joints. A level 5 wall takes that two steps further and floats out the entire wall for smoothness. “It is a noticeable difference and people do comment on it,” McDowell explains. They chose all LED lighting in order to be as efficient as possible, and have a smart home with lighting controls, burglar alarm, distributed audio and video, and HVAC that they can control from anywhere in the world.